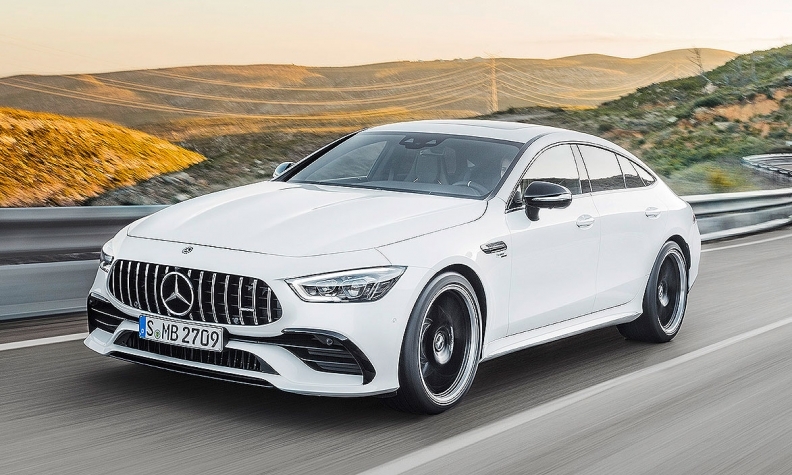 The long-teased Mercedes-AMG GT four-door will come in three variants -- two with a V-8 and one with an inline-six engine -- and go on sale early next year in the U.S. and Canada. The most powerful V-8 entry will produce 630 hp. After much speculation about the car's name, Mercedes on Tuesday said it will be called the AMG GT 4-Door Coupe. It joins other coupes and convertibles to give the AMG GT lineup its first four-door sports car. It debuts Tuesday at the Geneva auto show. The top-of-the-line variants are the GT 63 with a 577-hp hand-built 4.0-litre, twin-turbo V-8 and the GT 63 S with a 630-hp hand-built 4.0-litre, twin-turbo V-8. The V-8s have cylinder deactivation to improve efficiency and reduce fuel consumption. There also will be a version arriving for AMG's new 53 midrange performance line. The GT 53 will be powered by a 429-hp AMG-enhanced 3.0-litre turbocharged in-line six. It will have an electric EQ Boost feature enabled by a starter-alternator between the engine and transmission offering additional output of 21 hp. The GT 53 also has a 48-volt electrical system. The launch vehicles will be 2019 models. The GT 63 and 63 S will go on sale in early 2019, a Mercedes spokesman said, while the GT 53 will arrive in mid-2019. All variants come with all-wheel drive. Drift mode is standard on the 63 S, optional on the 63 and unavailable on the 53.